Beecher's is an oh-so tasty artistian cheese maker located in Seattle's Pike Place Market. Though this is always a good choice for a bite, Beecher's is especially perfect on a grey Seattle day. We're talking about the ultimate in comfort food and quite possibly the best homemade cheese EVER. Perfectly toasted grilled cheese sandwiches, creamy tomato soup, and to-die-for grown up macaroni and cheese are all found on a busy corner in the heart the Market. I suggest you order up, grab a stool and watch the cheese makers slowly create bliss in an open vat. 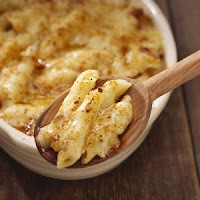 The best news for out of towners is Beecher's ship their delectable Flagship Cheese and that World's Best Mac 'n Cheese anywhere in the country. This superbly Seattle eating experience won't disappoint and have you thinking about how soon you can get back there. Good news - Beecher's flagship cheese is available locally at Spokane Safeway stores. Log on the website for recipes.